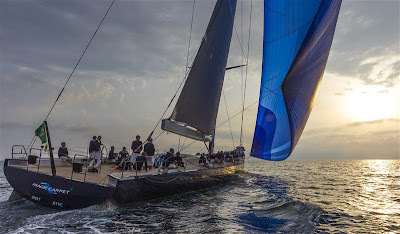 By crossing the finish line in Genoa at 20:06.48 CEST on Thursday evening, Sir Lindsay Owen-Jones’s Wally Cento Magic Carpet 3 (GBR) has secured line honours in the 61st Giraglia Rolex Cup. Niklas Zennstrom’s Ran 2 (GBR) was second to finish some four minutes behind closely followed by Andres Soriano’s fellow Mini Maxi Alegre (GBR). The race record remains the time set by Esimit Europa 2 (SLO) in 2012: 14 hours, 56 minutes and 16 seconds. Further reports, including a full event wrap-up from the Giraglia Rolex Cup, will be available in due course.